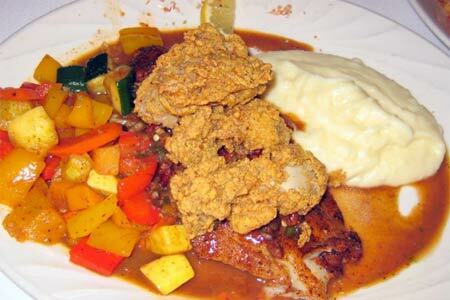 K-Paul’s is still considered one of the best Cajun/Creole dining experiences in New Orleans. : Opelousas, Louisiana-native Paul Miller helms the kitchen at K-Paul's, the restaurant from Paul Prudhomme. The chef turns out Cajun-Creole fare worthy of the master's stamp. Hallmarks of the daily changing menu include super-rich sauces; the definitive blackened fish and beef dishes; intensely seasoned, roux-thickened gumbos; fried crawfish tails (in season); and classic bread pudding and a sweet potato-pecan pie with a big dollop of Chantilly cream. Crafting a wine list for this food is difficult, but the selections recognize that big flavors require big wines to stand up to them. Plus, there's a smart list of Champagnes and sparkling wines to act as palate refreshers for the robust fare. Lunch is deli-style, so if you have only one opportunity to dine at K-Paul's, make it dinner. The two levels are stylishly lined with bare brick, framed wall art and gleaming wood floors. The balcony and enclosed courtyard set with marble-topped tables can be delightful in good weather, and the latter can provide a somewhat quieter dining experience.